The past 6 weeks or so I’ve spent discussing the importance of creating extended families on mission (Missional Communities of 20-50 people) and in the midst of that time I’ve been doing workshops talking about similar things. So many pastors are looking for the Silver Bullet. They are looking for the one thing that can save the day and keep their church (and the church in general) from the precipitous decline they are facing. First, I do believe there is a Silver Bullet for the church and it’s discipleship. However, the issue is that discipleship is something that is simple, but hard, not complex and easy. It takes a while. And because we’ve been about building churches first and foremost (hoping it would grow as quickly as possible) and rather whimsically hoping we get disciples out of it, we’re not accustomed to the amount of time and energy it takes to make even one disciple. More and more I see this phenomenon happening with Missional Communities (MC’s) as well. I meet pastors who are looking for a quick fix to their seemingly unfixable problems. They assume that learning how to start, grow, disciple people and multiply MC’s is as simple as doing a 40 Days of Purpose sermon series. But it’s just not. It takes a long time to learn it. Most pastors spend years and years becoming experts in running Sunday morning worship gatherings. They go to seminary for it. Spend 15-30 hours of sermon prep each week. Many grew up attending worship services and are thus pre-conditioned to have a certain level of expertise already (through the immersion process). If I were to hazard a guess, I’d say it takes about 5 years of hard work before a pastor feels really competent in large gathering services. A lot of time and energy have gone into this. Why do we assume that learning something like Missional Communities will be any easier or take less time? Why do we think we can learn to do MC’s faster than we can learn the worship service, something that most of us grew up with? MC’s are foreign to so many of us. It’s not like we can stick it in a microwave and pop it out. I was talking with our Director of Content last week, Doug Paul, and he mentioned that he didn’t feel he was competent in launching, growing and multiplying Missional Communities for 18 months…and even then, he only felt he was “OK” at it and was still a ways off from “very good at it.” I imagine people like Michael Stewart at VERGE/Austin Stone and Jeff Vanderstelt at SOMA would agree, as they’ve been doing great work with Missional Communities for several years now. It’s not easy, it’s not quick and it takes time to learn. Now it’s completely worth it, but if we approach it like it’s a quick fix that will come easily, we’ve got a surprise coming our way. Many men can build a fortune, but few men can build a family. Similarly, I would say that many pastors can lead a worship service, but few pastors have the patience to learn the art of Missional Communities. It’s going to take longer than a week, a month or a year! When we try to lay ‘missional’ over top a deeply embedded quick fix culture we ensure failure all around. We’ve got to build on a new foundation and lay aside false ideas and presumption before we can build the new thing God desires to do in our midst. Sadly, I think this is quite true. Even in some of the churches most committed to “making disciples” it seems that the deep, long process of producing a culture of men and women who get the DNA of reproducing truly productive generations of disciples disintegrates in the swirl of “good” things. It is hard not to want a silver bullet when the ship seems to be in danger of sinking on our watch. This was very evident at the Denver gathering last week. I think it is ironic that ideas such as extended family seem revolutionary to pastors, but in matter of fact is what Paul viewed as God’s family or the Family of Families. Thanks for your heart and not giving into the flash in the pan forms of ministry. Although for church planters, it is challenging in the early days it seems since most people are not interested in paying a pastor to do ministry like Jesus! gotta love the reality of 1 Cor. 4:15 and 1 Thess. 2:7-8. It comes back to the fundamental call of God to the cross, to death. All good harvests require death, silent and underground, for some period of time. No resurrection of the church without death first, which here is the rejection of the quick, the easy, and the impersonal and programmatic. If any man seek to save his public and respectable church, he shall lose it, but if he lose his life through discipleship and true fellowship, he will find the church resurrected and alive in his midst. 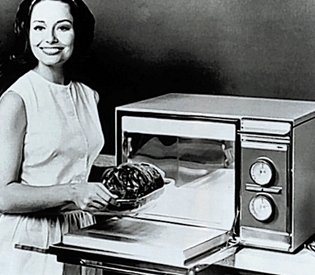 I would take it one step further beyond a microwave society to the age of the Ronco “you set it and forget it”. Not only do we want to have it now, but we want to forget about the work that goes in to making “it”, albeit a steak, turkey or deeper relationships with God or the people around us. We no longer want to put in the effort or the energy for deep-meaningful-breakthrough relationships, we just want them now. In terms of this article, relationships take time but the culture we live in has moved from being invested into a relationship with someone to the internet, have-it-now dot com, becasue we want instant gratification (Not to say all internet relationships are bad, but relationships do take time and patience and the divorce rate is really high, another quick fix for some, again not all). My point in all this is it seems we have moved so far away from the hands that have formed/shaped/knit us that we have almost lost/forgotten what it takes to work in the garden. Thank you for these words, may God’s peace bless you and your family now and forever + Amen. I’ve seen that quotation by J.S. Bryan a few different places now, but I’ve yet to see any explanation of who J.S. Bryan is. Did I miss something? Who is he? Did this quotation come from a book he wrote? It’s actually a quote vy Bryant lifted from Guy Kawasakis book “Enchantment.” not sure where it originally comes from. Is having to “unlearn” harder than learning? Its definitely harder to swim upstream against the flow of the “perceived norm”. Almost everyone agrees (in theory) that mission and discipleship are essential – but praxis is debatable – is this because they don’t truly believe that Jesus’ methodology is still valid let alone the best way. Or is the bottom line that if they upset folk then they (pastors) are just out of a job? Still attempting to live a life “beyond explanation”! I see the ‘difficulties’ faced come out of the conditioning of church and leaders to presume the service, preach, pastor modal of local Christian community to need tweaking in order to restore faith and favour from the broad community toward it. I believe that devolving this modal is the only way that church will grow. Event (not necessarily on a Sabbath or weekly) and engagement are the ways Western society works. If people feel that a Worship and Word event is appealing then they will make time to attend but the base community comes out of engagement with ‘family’ (for want of a better descriptive term). The body of Christ, existing in diversity of community, has the capacity to draw seekers and sojourners into a committed discipleship if time, energy and resources are equally applied to engagement as well as event. Unfortunately much of the efforts of Christian leaders, and so the occupation of their time, energy and resources is at present directed toward events. This creates a one dimensional discipleship that will not withstand testing as the times demand. thank you for this painful reminder! always good to hear from others who are in the trenches and living it out. Thanks for the insight and challenge, Mike. I’m finding that starting a new expression founded on MC’s is something that I’m failing quite consistently at! Those of us who have our background in more attractional modes of church find the ideas of living as oikos of faith refreshing- but it’s way easier said than done. Even being relational to the core, I find myself constantly fighting the benchmarks of more traditional church plants, and fighting the temptation to simply create the church service experience within the house, and call it a missional community. It’s requiring unbelievable patience, trusting the Spirit and the relational formation process in this season of abiding. And yet there’s a wonderful sense deep within me that is unmistakably Kingdom stuff. Looking forward to being with the LC gang in Atlanta next week for encouragement and new vision! PAL’S PEN: If You Were Satan – What Would You Do? Christ was dead, buried, and resurrected. If we who claim Christ don’t believe that we have nothing. Better yet, if it didn’t happen we have nothing. What gives proof to an unbelieving world that it happened? A life that radiates the light of the risen Lord. Question: How bright does His light shine in you? It seems the early church struggled early on to get it to shine brightly. From Christ’s death to about 100 AD they grew to about 25,000. Then, the church caught fire, and all heaven broken loose. The early church exploded from 25,000 to 20,000,000 in the next two hundred years. Keep in mind the world’s population at that time is thought to be about 300,000,000. Therefore, by 300 AD the church represented approximately 8 – 10% of the world’s population. Considering the early church was vastly illiterate and poor that’s not bad growth, huh? Think about it. They didn’t have extravagant facilities. No professional speakers or music, no automobiles, phones, computers, Internet, bibles, printing presses, tvs, etc. Was their presence noted only by name on a membership card as if the church was the Rotary Club, or Toastmasters? Would that do well to define the extent of their impact in the world in which they lived at that time as the IC appears to do today? Not when you consider they were transforming the culture, and bringing Rome to its knees. Think about it. Rome crucifies Christ, and thought they put His revolution to bed. Three hundred years later Rome is being outflanked by an army twenty million strong carrying His cross. What do they do now? Better yet, if your job was to work as the chief enemy agent of this uprising, this revolution, we’ll call you, “Satan”, what would you do to darken the light, and restrain the power? First, you’d have to analyze how they operated, where they met, and what made them the force they were. Then, you would have to come up with a master plan to subvert what they were doing, and weaken their movement, but in a way that didn’t appear that was what you were doing. In other words, you have to come as an angel of light. Here’s a thumbnail sketch you as Satan would make of the early church. 1. They met primarily in homes. 2. They had no centralized control center because each home operated as its own church. 3. They circled up face to face, shared their burdens, confessed sin, confronted each other about sin, submitted to one another, were devoted to one another, gave sacrificially to each other, and “one anothered” one another. 4. They were identified through familial terms, spiritual fathers and mothers, brothers and sisters. 5. They reproduced quickly like rabbits multiplying from home to home, neighborhood to neighborhood — not like elephants as the IC does. 6. Power was evenly distributed to all, not a few “professionals” . 7. There was no one leader controlling everything week after week ad nausea, but all gifts were empowered for full operation, teaching, preaching, singing, discipleship, healing, communion, etc. 8. They were all empowered as God ordained the ‘ordinary’ to do extraordinary things. They didn’t need permission from a ‘professionalized’ governing authority to do so. They moved as they were led by the Holy Spirit in the moment to move. 9. If a leader moved on other leaders rose to immediately take their place. They didn’t go to another church to hire their leader away as the IC does. The trick for you, as Satan, is find a way to stop it. You can’t…unless you can somehow divert attention to something that seemingly does it better when it reality it removes the power and radiating light transforming it to something stale and dank. This means, of course, this master plan would have to consist of getting them out of the homes they met in, centralize their decentralized system, place them in a row of noses looking into the back of a stranger’s head stifling communication and intimacy, construct elaborate, expensive control centers that are hard to fund and duplicate, take the power away from all the people and place it into the hands of a few “professionals”, become a performance based system around a lecture with no interactive Q and A leaving people to forget 95% of the message, restrict reproducing the church to professionalized leadership, and then legalize ordination.